This years May Day demo was much bigger than in the previous years. According to the cops 30.000 people joined the demo, organising CGT stated that 80.000 people joined. At the front of the demo there was a black bloc with more than 1.000 people. The black bloc was well organized and equipped. Shortly after the demo started marching from Place de Republique black bloc activists came to the front of the demo and after a short standoff cops fired teargas and rubber bullets into the crowd. Activists responded with stones and molotov cocktails. The attacks by riot cops were getting harder and splitted the demo, which was used by CGT security guards to go after protesters with telescope bars and pepper spray. But the confrontations were far from over. The cops were suprised by the intensity of the attacks by blac bloc activists and tried to keep distance. For some time they were only shooting with teargas and rubber bullets into the crowd from a distance. After a while cops were hitting everybody who came near to them. One of the injured people was a 60 year old after he was beaten up with batons by cops. But the black bloc activists continued to attack riot cops. They had enough molotov cocktails during the whole demo to keep the cops on a certain distance. 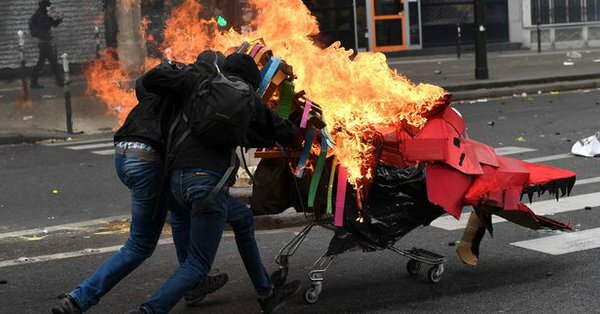 France is rocked by riots for months now and the struggle will continue.